The Huichol are a Mexican-Indian group also known as the Huichole, Tevi, and Wizarika. They live primarily in western Mexico in the Sierra Madre Occidental mountains. 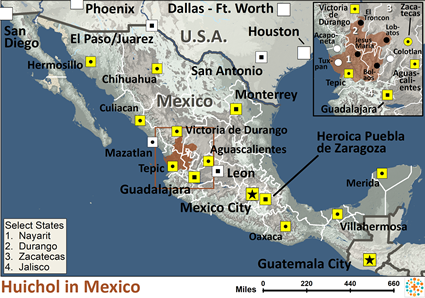 This area includes some of the most rugged terrain in Mexico. It is typified by mesas, cliffs, and river valleys and is covered mostly by scrub and thorns. The origins of the Huichol are unknown. Historically, the rough topography of their homeland insulated them from outside influences. They held out against Spanish colonialism until the 1720s, and even after being conquered by the Spaniards, they maintained a high degree of self-rule. Since Mexico gained independence from Spain, the Huichol have had to contend with Spanish-Indians, or mestizos, who have attempted to take over Huichol landholdings. Today the Huichol are no longer as isolated and are beginning to become a part of the Mexican society and economy. Most Huichol provide for themselves by growing their own food. Maize, beans, squash, and chilies are common crops. These crops are cultivated with animal-drawn wooden plows and digging sticks. Most families own livestock such as cattle, donkeys, horses, pigs, chickens, and turkeys. Huichol men wear brightly embroidered cotton or muslin shirts as part of their ethnic costumes. They also wear leather sandals and braided palm hats. Women wear colored skirts and blouses and decorate themselves with bright necklaces. Marriages are arranged by the parents when the children are very young. Huichol usually marry between the ages of fourteen and seventeen. Extended Huichol families live together in rancho settlements. These tiny communities consist of individual houses which belong to a nuclear family. Each settlement has a communal kitchen and the family shrine, called a xiriki, which is dedicated to the ancestors of the rancho. The buildings surround a central patio. The individual houses are traditionally built of stone or adobe with grass-thatched roofs. A district of related ranchos is known as a temple district. Temple districts are all members of a larger community district. Each community district is ruled by a council of kawiteros, elder men who are usually also shamans, or witch doctors. Although they live in an overwhelmingly Catholic nation, the majority of Huichol are animists. This means that they believe non-human objects have spirits. The people seek to appease the gods and spirits which they believe exist in nature, such as in fire, the sun, and the rain. Huichol believe witch doctors can mediate between the gods and man. These shamans supposedly receive guidance through dreams which instruct them how to treat illnesses and perform ceremonial functions. The shamans communicate directly with the gods through prayers which sometimes last as long as three days. Shamans also engage in sorcery and witchcraft. The Huichol believe that when a person dies, his soul embarks on a five year journey through the underworld. After the journey, the soul returns to earth and is captured by a shaman in the form of a rock crystal. The crystal is placed in the family xiriki to be anointed with blood and offered food. The Huichol are an oppressed people, desperately in need of a Savior. They are entrenched in their worship of spirits and gods, and are proud and fiercely independent, traits which could limit their openness to the Gospel. Today, there is an unprecedented opportunity to reach the Huichol with the message of Jesus. The New Testament and the Jesus film are available to them. 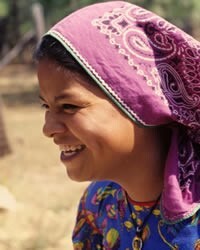 The Huichol need much prayer and additional laborers to work with them so they may be reached with the Gospel message. * Pray that God will strengthen and encourage missionaries presently working among the Huichol. * Pray that God will give Huichol believers boldness to share the love of Jesus with their own people. * Pray that God will bring forth much fruit as the Jesus film is shown to the Huichol. * Pray that God will save key Huichol leaders who will boldly declare the Gospel to their people. * Pray that God will raise up strong local churches among the Huichol.View Huichol in all countries. Location in Country: Nayarit and Jalisco states: Cohamiata, Guadalupe Ocotán, Nayarit, San Andrés San Sebastián, Santa Catarina, and Tuxpan de Bolaños; smaller areas, Durango, southernmost tip, and western Zacatecas.